The 1565 painting The Hunters in the Snow by Pieter Bruegel the Elder depicts a rural scene with weary hunters returning to a town, as birds perch in the trees on the branches above the scene. You may recognise the piece, as it’s been used in many films such as Solaris and Melancholia. 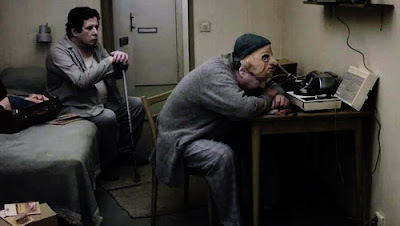 Roy Andersson looked at this painting. He said that, in this painting, he imagines the birds on the branches to be looking down at the people and wondering what they’re doing. From this little thought, he came up with A Pigeon Sat on a Branch Reflecting on Existence, a completely bizarre film that subtly questions our existence in a series of unusual episodic shorts about life. Written and directed by him and out now on DVD & Blu-Ray, A Pigeon Sat on a Branch Reflecting on Existence is a very unique piece of work, finishing off his ‘Living Trilogy’ following Songs from the Second Floor & You, the Living. As those who follow my writing will know, I’d usually take a moment here to describe the plot. Here, I cannot. There isn’t much by way of an overarching story and, for what story there is, you’d be better off experiencing it yourself. I doubt there’s a huge audience for this film, but the ones who will understand it will love it. Everyone else will probably wonder what the f*ck they’ve just watched and try and erase it from their memory – and I don’t think Roy Anderrson would have it any other way. As stated, A Pigeon Sat on a Branch Reflecting on Existence is made up of many, for lack of a better term, short films. Similar to Damián Szifron’s Wild Tales, these tales are seemingly unrelated but share common themes and style. It is said by some that the titular pigeon is in fact the director and writer Andersson, and it is his reflections on existence are here in this film for us to see. If that’s the case, I could not live inside his mind. As with people like David Lynch, I love to watch his instantly recognisable works and experience his vision in short instalments, but I couldn’t imagine spending long inside the twisted absurdist minds that create this sort of stuff. But it is truly a pleasure to spend 90 minutes with Andersson or Lynch, although often rather disturbing. As such, there is very little (if any) mainstream appeal in this. If you’re not interested in bleak and quiet arty cinema, steer clear of A Pigeon Sat on a Branch Reflecting on Existence. But if you’re ready to experience and analyse some very absurd and surreal imagery, look no further. When it comes to film production, Anderrson is a genius. Whether you like/understand his work or not, there’s no denying the insanely specific and intricate attention to detail in every single shot. A Pigeon Sat on a Branch Reflecting on Existence is not a film you watch. It’s a film you experience. It is cinema as an art form. Each of the short stories is effectively a moving, talking painting – from the bleak, washed out colour palette to the long, still takes; shots from this film would not be out of place on the walls of an art gallery. But some of this film isn’t pretty. It is disturbing at times and often rather unsettling in its silence and deliberately slow pace. But therein lies its charm, especially for fans of Anderrson who have come to expect this sort of delivery. Because of this, A Pigeon Sat on a Branch Reflecting on Existence is a difficult film to review. It’s very much aimed at a specific target audience who can appreciate and enjoy such a bizarre piece. If you don’t get it, you will hate it. But if you’re a fan of Anderrson’s, or minimalist absurdist art cinema in general, you’ll love every long and quiet second of A Pigeon Sat on a Branch Reflecting on Existence. A Pigeon Sat on a Branch Reflecting on Existence ends a unique trilogy on a strong note, and flies away with 5/5.